Description: Bellflowers are among the most popular of perennials. This is an outstanding selection with a mid-sized habit. 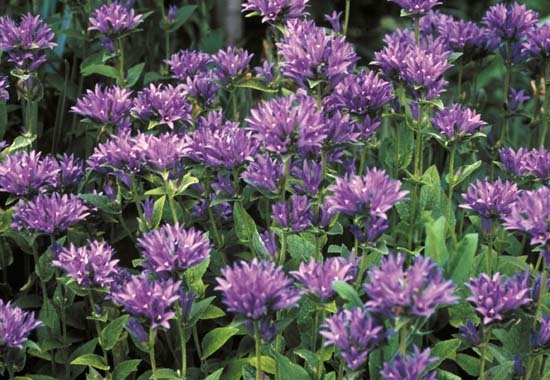 Plants form a mound of coarse green leaves, bearing large clusters of deep purple-blue flowers in mid-summer. Outstanding Features: Great texture, looks great with orange or yellow, or iris. Uses: Cut flowers, boarders, attracts butterflies. Looks terrific in the border with any dwarf white Shasta Daisy, or plant next to something gold or yellow for a spectacular contrast. Rabbit resistant. Tips: Quickly spreads to form a small patch, but easily managed by dividing plants in spring or fall.